School is back in session in the Valley of the Sun and that can mean only one thing: the return of the Robison Orthodontics – Back to School Special. Through September, in addition to offering free consultations to their valued patients, students who start full treatment can receive $500 off and teachers who begin a full treatment can receive $1,000 off. Prior to starting treatment, the technicians will use the Itero digital scanner to simulate the outcome and they will create digital scans for Invisalign patients. 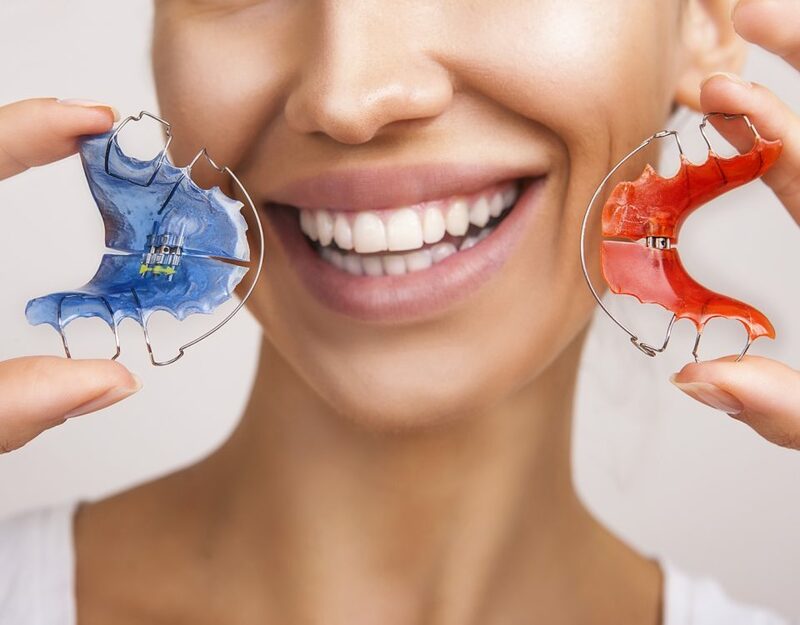 For people who are unfamiliar with this option, the friendly and caring staff at Robison Orthodontics will be happy to explain the benefits of Invisalign. “If they start treatment before the end of the year they may receive a free iPad and $200 donation to their school,” the spokesperson noted, adding that this generous offer is valid for new patients who mention this promotion upon starting treatment. In addition to the Back to School Special that is underway at Robison Orthodontics, they are also gearing up for the popular annual Candy Buy Back event. The temperatures may still be on the warm side in the Gilbert area, but Dr. Tyler Robison and his staff know that Halloween is right around the corner—and that many of their young patients will collect lots of candy while trick or treating. To entice children to trade in the candy for money—and keep all that sugar away from their teeth and orthodontia—Robison Orthodontics will launch the 15th annual Candy Buy Back program. Between 8 a.m. and 5 p.m. on November 1, kids can bring their candy into the office and get paid $1 per pound for the sugary goodies. Their school will also receive $1 for each pound that is donated. 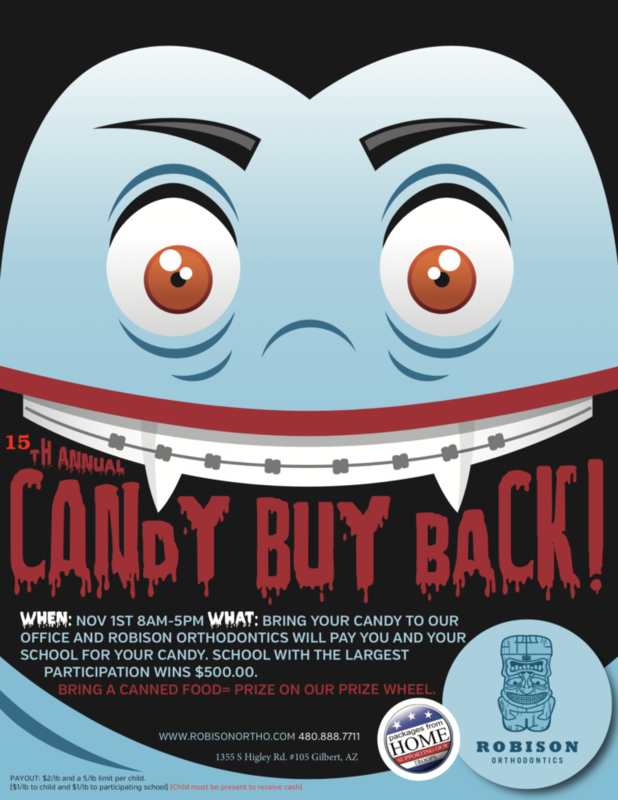 Children can donate up to 5 pounds of treats, the spokesperson noted, and the school with the largest participation will receive $500. The donated candy will be added to care packages that are sent to members of the military through the Packages from Home program. Wearing a retainer is usually an important step in the treatment process after you or your child gets braces off. However, it can be difficult to remember to wear the retainer and you don’t want to have to go through treatment again. Missing one night here or there is not usually a big deal, but there are tips to help you remember to keep your teeth straight. Writing down the instructions that the orthodontist in San Tan Valley gave you will help you remember. Whether the orthodontist says to wear a retainer all night, day or just a few hours at certain times, writing instructions down on paper commits them to memory. This is a good time to make sure you understand all the instructions. Be sure to ask your orthodontist if things are unclear. Every time you take out the retainer, be sure to clean it. If you go to put your retainer back in your mouth and it’s dirty, you may be tempted not to wear it. Take the time to clean it every day, even if you are in a rush. If you have to wear your retainer to sleep every night, put a note on your mirror reminding you. You can also use notes in your wallet, purse or car if you have to wear it during the day. Set up daily reminders for when you are supposed to wear the retainer. You can use your phone or an email calendar to set up alarms. Once the alarm goes off, go get your retainer. If there are only certain times you have to wear your retainer, use a recurring event to help you remember. It could be something like watching a weekly TV show, when you typically do laundry or on a family game night. Use the event to serve as a reminder to put in the retainer. When you do take out your retainer, make sure that you always remember to put it in its case. This will help reduce the chances of throwing it away or losing it. You won’t have to go through the trouble of getting a new one or having to pay for a replacement. For some extra motivation, look up pictures of what can happen if you don’t wear the retainer. This works for those who are more visual, and you don’t want the same thing to happen to you. It is also good to remind yourself how much you didn’t like braces. If your teeth shift too much, you will have to go back to wearing braces. If nothing else is working, ask for help. Let your family or roommates know you need some help and have them kindly remind you to wear your retainer when you are supposed to. Assure your family and friends that it won’t be considered nagging and that you would appreciate their help. If you find your retainer is uncomfortable or painful and feel like it’s hard to wear, be sure to speak to your orthodontist. It may need to be adjusted to make it more comfortable for wear. When you're considering braces for your child or yourself, there are a million questions that run through your mind. You have a familiarity with the dentist, but orthodontia is a world that's brand new and seemingly complex. Put aside any concerns because your questions will be answered as you work with a reputable orthodontist. Explore these common concerns to that the next appointment goes as expected. One of the first questions from patients today is the expected time for treatment. As orthodontia professionals, we cannot give you an exact time frame. Every patient has different needs. A patient who has slightly crooked teeth might need braces for 6 to 12 months. In contrast, other patients wear braces for up to three or four years. Your Queen Creek orthodontist focuses on several elements within the mouth. Your bite, impacted teeth and alignment are the main concerns. Doctors use a mixture of braces, rubber bands, springs and other tools to move those teeth into perfect position. Your treatment period depends on the length of time it takes to align these features into place. Do braces hurt? This question is common because wearing metal on the teeth appears uncomfortable. In reality, wearing braces is completely comfortable after you get used to them. The orthodontist installs brackets on the teeth with an adhesive. Those telltale wires go through the brackets afterward. As the doctor or hygienist tightens the wires, you'll feel pressure on your teeth. This pressure is designed to move the teeth into place over time. There shouldn't be any major pain involved. The doctor even gives you some wax to use on your braces if they initially rub on your cheeks. Certain foods must be altered or avoided altogether when you have braces. Your orthodontist can give you a list for clarification. Eat an apple, but cut it into slices beforehand. Skip the peanut butter. Save corn on the cob for when the braces are taken off. Most other foods are perfectly fine with your oral appliances. As soon as braces are installed on your teeth, the logistics of caring for them might settle in. You may wonder how you'll be able to brush and floss them without damaging the wires. It's a fact that braces are sturdy appliances. Unless you strike them with a solid force, they'll stay aligned. Brush your teeth as you would without the braces. Use a slower motion, however, so that the bristles don't catch on the wires or brackets. Your orthodontist has several options for flossing. A tool that attaches to standard floss can be used so that you're moving the string between the teeth as you should each day. Discover your orthodontia options at Robison Orthodontics today. Our team is pleased to evaluate and solve your tooth-straightening issues. A gorgeous smile is possible with the help of our expert adjustments and orthodontia strategy. Those braces will be on and off in no time with the right professionals by your side. Using braces to improve the health and appearance of a smile isn’t just for teens, because with Invisalign clear braces, adults can also now have a dazzling, straight smile they can feel good about. Below are five reasons for adults to choose Invisalign instead of metal braces when working with the team at Robison Orthodontics. Due to the busyness of home and work schedules, it can be difficult for professionals to make time for regular appointments to adjust their braces. These appointments can be required as frequently as every week. By choosing Invisalign from Robison Orthodontics, you’ll get multiple sets of aligners which will prevent you from having to make weekly visits. When you begin your treatment course, you’ll receive clear instructions for how to work with your Gilbert Invisalign braces. You’ll learn the length of time to keep each aligner in, and you won’t need to visit our office until you’re ready for another set of aligners. 2. They’re easy to care for. A second reason for choosing Invisalign is the ease of caring for them. Because they’re made with plastic, you’ll be able to take the braces off when brushing and flossing which promotes healthy teeth and gums due to thorough cleaning. 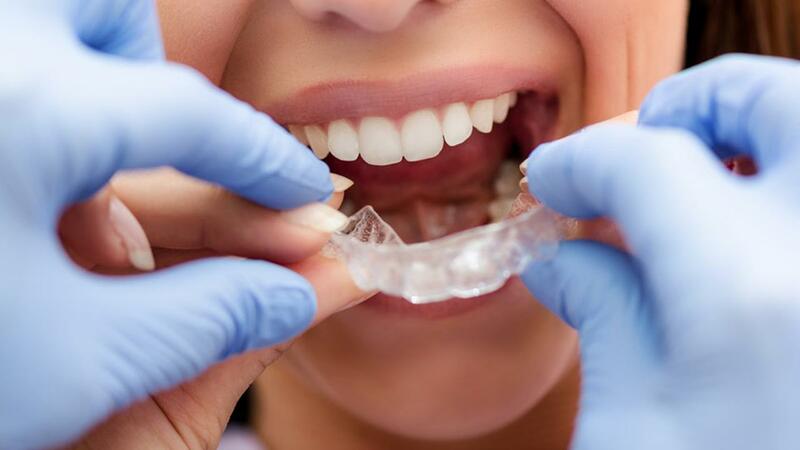 The aligners are also made to come off before eating anything, and you’ll have a specially designed solution for the cleaning and sterilization of the aligners. One of the top reasons adults choose Invisalign braces as opposed to metal braces is the aesthetical appeal. 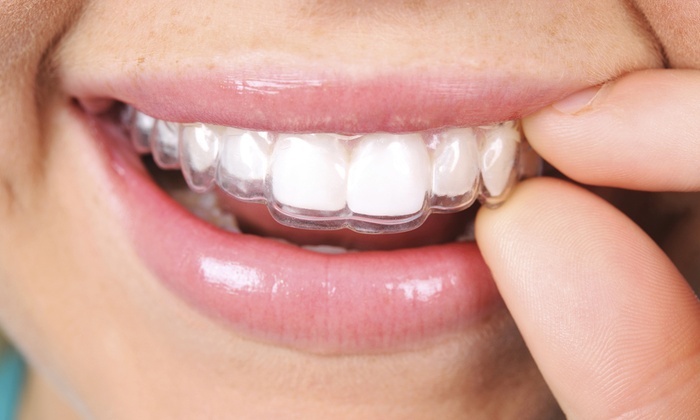 Since the braces will be nearly invisible while they’re working to adjust your smile, you’ll be less self-conscious. The clear aligners allow wearers to continue their normal schedules for home and work appointments without having metal braces that stand out. 4. They offer good treatment time. Along with spending less time visiting the office, your treatment time may be faster than conventional braces. A lot of adults are interested in Invisalign to adjust teeth that were previously straightened but have drifted. As a cosmetic solution, often treatment for such adults will take less than a full year especially if they’re careful to follow the instructions for use. For those who are using Invisalign for an initial treatment plan, the amount of time treatment will take is generally similar to those using conventional braces. 5. They provide consistent, dependable results. Invisalign braces provide consistent and dependable results for patients who follow the prescribed course of treatment which is 22 hours wear each day and proper cleaning and sterilization. Many of the patients here at our office who stick to the plan are happy with their results. 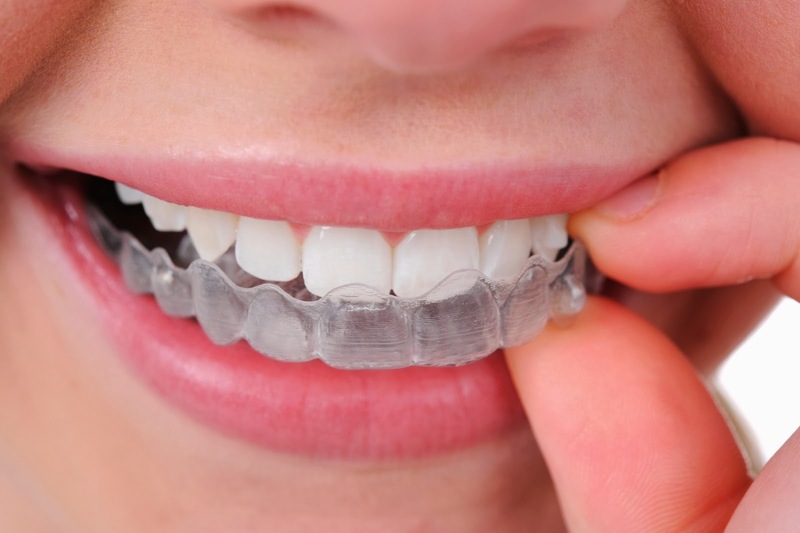 If you’ve been considering trying Invisalign braces, Robison Orthodontics can help you achieve a beautiful smile with this effective and simple method of treatment using clear braces. You can get more information or schedule a consultation by calling us today. While braces are commonly associated with teenagers and adolescents, adults are fine candidates for braces. There's been an uptick in adults with braces in recent years. It makes sense. After all, there's no time like the present in order to get your teeth in shape and looking beautiful. As an adult, you have a better understanding of personal responsibility, which can make you a real blessing for an orthodontist. If you're considering adult orthodontic treatment, this blog will be very beneficial to you. Getting braces is a medical decision, but it's also a personal one. If your teeth are spaced or have issues such as an overbite or underbite that you would like corrected, you should do so. Make sure that you are able to afford it. Check your current dental coverage and see if braces are available under the plan. If you aren't able to be properly covered, you should shop around for another plan. 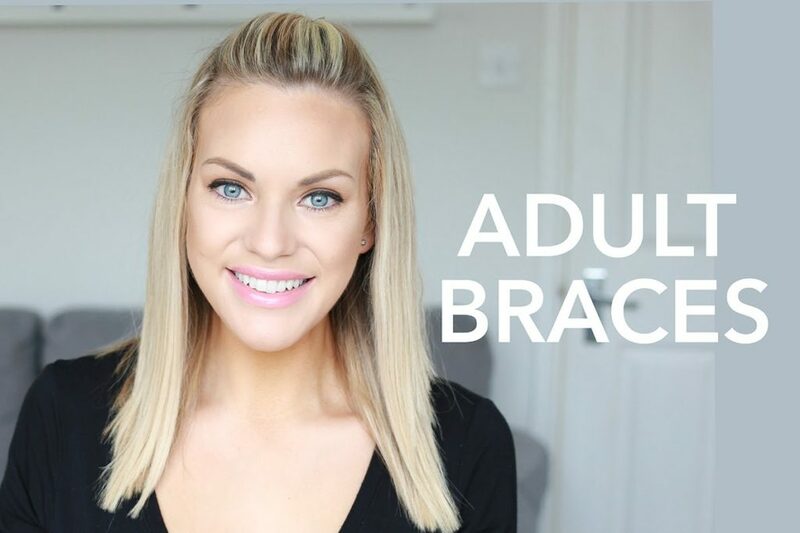 As an adult, there are some things you should keep in mind when getting braces. While your teeth can and will be benefitted by the corrections that braces provide, there are some restrictions. For one, your teeth are usually all fully grown and developed in adulthood. Therefore, you won't have the benefit of certain issues being improved through your teeth growing. It will also take longer for your teeth to be corrected than it would for children or teenagers. Since you've had to wait longer for braces, there will also be more issues that might not be easily remedied. These could require additional oral surgery or procedures such as extractions. Braces will be a big help, but they might not be able to fix all the teeth issues you have. 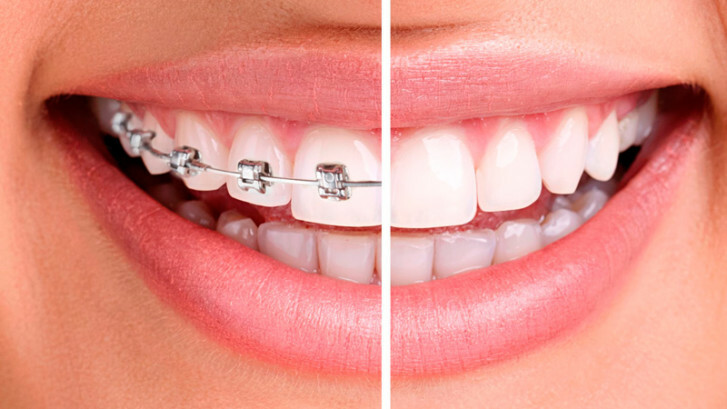 Understanding what goes into receiving and maintaining braces is crucial. It takes a couple hours to have them put on. After which, your teeth will be sore for at least a few days. Make sure you are eating foods that are soft enough to be consumed without excessive chewing during this time. You might also need to use pain relievers like Aspirin in order to manage the pain. You'll also need your braces adjusted on a regular basis. This can be painful as well, but not to the extent of getting them on for the first time. As an orthodontic patient, you need to make sure you follow instructions when it comes to maintaining your braces. You need to make sure you are eating correctly. Foods like popcorn and gum can get stuck in your braces and be difficult to extract. You also need to be maintaining your teeth. Brush properly and learn how to floss with braces. Figure out how to thread the floss through the braces and remove any food that gets stuck between your teeth. When it comes time for your braces to come off, you'll be glad that your teeth were maintained. When you get your braces off, you might need to wear a retainer for a period. Make sure you follow your orthodontist's instructions. If you neglect to wear your retainer, you might have to get braces again. As much as we encourage people to get braces, we don't want you to have to go through it more than once. Getting braces is a very big decision to make as an adult. We hope you realize just how many advantages there are. You can really give your teeth a boost and embrace a whole new sense of confidence. If you're interested in braces as an adult, please give our office a call today. It has been a great pleasure to return to my hometown and practice orthodontics these past 14 years. How the time has flown by! Originally we opened in Mesa in 2003 at my father’s dental office only to add our Gilbert location shortly thereafter. At this time I’ve made the difficult decision to sell my Mesa practice to a friend and colleague. As of July 1, appointments will no longer be able to be scheduled in Mesa. My sole focus moving forward will now be our Gilbert patients and serving the amazing friends, old and new, that we have made here in the Southeast Valley. Additionally, my brother, Dr. Blake, is moving on to new goals and aspirations that he has and unfortunately will not be with us moving forward. It has been my great pleasure to work with him these past seven years. He will surely be missed by all. Very little will change moving ahead though. We will still largely have the same great team and be open the same amount of time that we always have been here in Gilbert. Planned appointments and other arrangements will not change. Our complete attention, time, efforts and care will now be only focused on our wonderful patients in the greater Gilbert area. Thank you so very much for entrusting us to brighten your smiles and hopefully your days as well. We love working with you and your family and friends! It has been our joy and pleasure and we look forward to many more years of wonderful experiences serving you!